Circa. 1920's - In 1837, Eli P. Farmer was sent to the “Brown Mission” (as it was called until 1860) by the Indiana Conference organized in 1832. The first church building, constructed in 1840, was a crude log structure built in the northwest section of the village on property donated by William Gould. It housed the congregation until 1848 when a second church structure was built across the street and just to the east of the log church.This church building had an interesting history as it housed the sessions of the County Court from 1853-1854 while a new Courthouse was under construction. 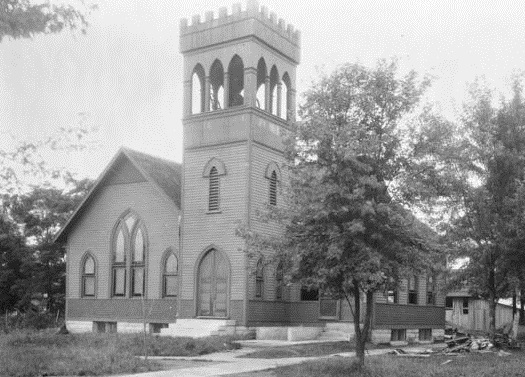 Because it was the only church in town at that time, it was also used as a meeting place by Baptist, Christian and United Brethren congregations. The original building eventually burned in 1909, and a new building constructed in 1910. Click here for more history of the church.